An Awesome "Fix" for Troubled Hair! I wish I could return to the days when my hair was untouched by artificial color--the natural auburn hue was incredible. My locks were hardy, healthy, and full of sheen. Not only did color begin a downward spiral, but an injury I endured caused me to have to take massive doses of Prednisone to control pain. The Prednisone is over--too much, obviously, has an adverse effect on one's body. But i...read moret contributed to hair damage. My hair began to thin, lost its luster, and broke easily. One stylist after another had asked me what I did wrong as I had straw-like layers and ends trimmed away. So I decided to completely overhaul my hair routine: 1) I now wash only every second or third day; with a dependable shampoo, my hair is still full of volume (I used to wash every single day, sometimes twice in the summer); 2) I use cool water when washing and cold water to rinse, as it seals hair's cuticle; 3) I allow my hair to air-dry whenever possible. I switched my hair dryer to an ionic one with a diffuser. While it takes longer to dry, it is gentler; 4) I always use a great thermal protectant product before drying; John Frieda's "Frizz-Ease Hair Serum Thermal Protection" has worked wonders in ridding me of parched strands; 5) I sleep on satin pillowcases. The less tug on hair and skin, the less damage that is done; and 6) I've committed not only to a great, moisturizing shampoo and conditioner, but an excellent deep-moisturizer and use it regularly. 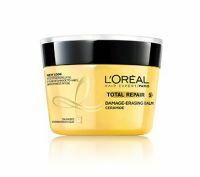 My new favorite is L'Oreal's "Advanced Haircare Total Repair 5 Damage-Erasing Balm." Yes, the claims on the label drew me in. It is supposed to "repair up to one year of damage in one use" (wow!). It is meant for hair which is dry, chemically treated, weak, rough, dull, dehydrated, and with split ends. The tub had my name written all over it! Would it live up to its claims? A resounding YES! I apply after shampooing to wet hair and massage through to ends, leaving it on for at least five minutes. My hair feels like satin when I rinse, without a heavy, greasy feel. Dead ends and fly-aways are less visible. There is sheen once more. This is the best deep-conditioning product I've tried in ages. I highly recommend it! Love the L'oreal Paris Advanced products! I bought this because I have enjoyed using the L'oreal Paris Advanced shampoos and conditioners and figured this would be an excellent mask I could use weekly. This is a relatively inexpensive mask that you can get at any drugstore or Target and it under $10. I absolutely love the smell, it makes me doing my weekly mask even more relaxing. The formula is this thick yellow formula that I rub ont...read moreo my entire scalp with most emphasis on my ends. The formula is supposed to help mend split ends and damage due to coloring, heat, and the elements; the container says it's supposed to heal one year of damage in one use. I agree with this claim because I always have split ends even if I only use heat on my hair once a week, I wash my hair every other day, and do masks weekly. This mask really helps repair that damage and seals up my cuticle so help it from breaking further until my next cut. It's called Total Repair 5 because it's supposed to repair the "5 signs of damage-split ends,weakness, roughness,dullness and dehydration." I agree with this claim because my hair is shiny, soft, bouncy, and as I said before, my split ends are repaired after having used this. I always use this after I have already shampooed and conditioned my hair and if you have the time it is so much better if you put a shower cap on while the conditioner is on and just let it sit on your hair for really as long as you want. I tend to put it on, put on the shower cap, and read a book and that keeps me from touching my hair and it's doing it's thing! I like to use this mask on Sundays only that way I am not over conditioning it and it helps me remember to do it the same day every week. If you want a well priced hair mask that does what it says buy this product, you won't be disappointed. Still looking for "the one!"